If you want to download photos of your friends albums from Facebook you have to do it one by one, if the album is large then its pain to download one after another. 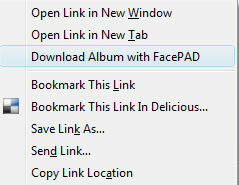 Facebook Photo Album Downloader is a Firefox addon that allows to download photos of entire album from Facebook. The photos are downloaded to the default Firefox download directory.